Be the first to share your favorite memory, photo or story of Tara. This memorial page is dedicated for family, friends and future generations to celebrate the life of their loved one. 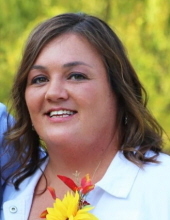 Tara Skelton Baker, age 39, of Paducah, KY, passed away on Wednesday, February 6, 2019 at Baptist Health Paducah. Tara was born in Paducah, KY on September 14, 1979 to Richard and Cassy Skelton. She was known as "Momma T" by her affectionately named "Heart Babies" whom she watched over. She was an active volunteer for the ACTS Ministry at Heartland Church and Good News Club and Glow at Farley Elementary. She had a love for Jesus, children, and fishing. Her passions included riding down country back roads with the windows down and cooking in the kitchen with a wooden spoon as her microphone, both while listening to country music as loud as she could play it. Tara will be remembered by those who loved her as someone who took care of everyone and who loved every day of life that was granted to her. She is survived her husband, Chad Baker; her parents,Richard and Cassy Humphreys Skelton; her daughter, Taylor Skelton Shaikh and husband, Kaleb of Paducah; two sons, Ridge Wesley Smith and Landon Cole Baker of Paducah; her sister, Tana Skelton Williams and husband, Matt of Paducah; her grandmother, Ruth Skelton; and her "Heart Babies", Katy Taylor, Jacob Taylor, Kaycee Rush, Austin Rush, Levi Hensley, Toby Hibner, Alexis Cavitt, Hunter Meredith, and many others. She was preceded in death by her grandfather, Artie Skelton; grandparents, Rubert and Marie Humphreys; and her uncle, Greg Humphreys. A Celebration of Life service will be held on Saturday, February 9, 2019 at Heartland Church with Dr. Nathan Joyce officiating. Burial will follow at Maplelawn Park Cemetery. Visitation will be held from 10:00 am until the 2:00 pm service time on Saturday, February 9, 2019 at Heartland Church. Expressions of Sympathy may take the form of donation to: ACTS Ministry, c/o Heartland Church, 4777 Alben Barkley Dr, Paducah, KY 42001. You may leave a message for the family or light a candle at milnerandorr.com. To send flowers or a remembrance gift to the family of Tara Skelton Baker, please visit our Tribute Store. "Email Address" would like to share the life celebration of Tara Skelton Baker. Click on the "link" to go to share a favorite memory or leave a condolence message for the family.